Helen Crump caught my attention earlier today with her reflective post Literacy: Not a desk job, but an identity job. It’s a great story reminding us of the connections between literacy, identity, learning and teaching. And then I learned there is more to the story. Helen’s post was inspired by an image, shared as part of the #blimage blogging challenge begun by Steve Wheeler and members of his personal learning network (PLN). You send an image to a colleague and challenge them to write a learning-related blog post about it. Helen sent me the public-domain image below. Along with some wisdom: Don’t overthink it. Just go with it. As random as Helen’s selection was, it actually is quite familiar to me. I live and work in Evanston, a city that shares a border with Chicago. Each sits on the shoreline of Lake Michigan. 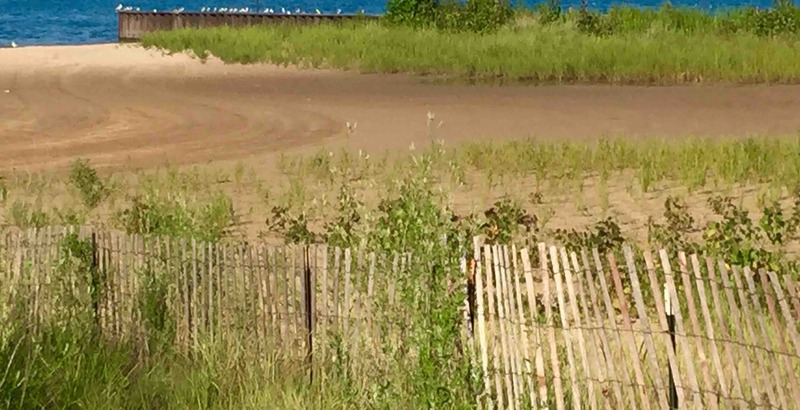 Every day this summer, I walk home along a path that follows the beaches and parks between my workplace – Northwestern University – and my home. 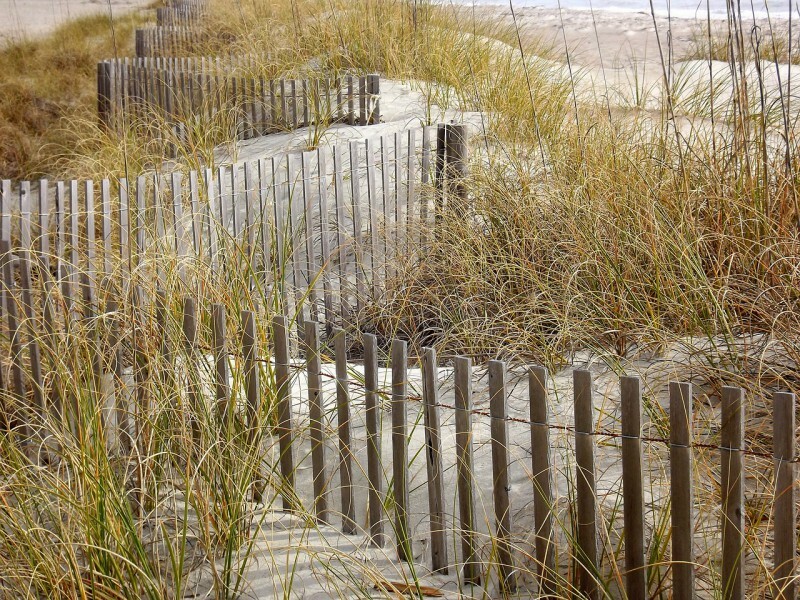 The sight of sand fences and grasses similar to this are common. I know just enough to know that the intention behind both the fence and the grasses are sand dune or beach preservation. They are light-touch attempts to nudge natural forces to progress maybe a little quicker. The result is preservation of an important, resilient part of the water/shoreline system. And what a great metaphor for pedagogy. When thinking about how we design interventions to nudge learners to progress maybe a little quicker, there is something important about paying attention to the natural contours of the landscape and how we might combine low-tech tools with organic elements to find a productive collaboration. The more I teach adult learners – an activity that is a combination of both design and facilitation – the more I appreciate the skills necessary to let learning just…emerge. The contours may be shaped a bit by fences and grasses, but the important stuff is what happens in emergent, organic form. Here’s an example to illustrate what I mean. A student recently told me about a successful graduate-school course. What made it work for them was the design and facilitation: “There was space for us to take ideas and make them ours.” And by “space” they meant time. Each minute of the course was not packed with directive activity. Students had time to socialize, to explore, to diverge, converge and reflect as they discussed course topics either online or in person. And my sense is that behind this was not just time, but realistic problems to address and thoughtful questions to consider. These, I am beginning to understand, are the subtle but powerful elements we have to shape the contours of learning: Time, realistic problems and great questions. Addendum – Pix from my walk home today. Really nice post, Jeff. And who’d have thought it, that the image pulled from the vast randomness of the internet resonated with you so close to home. I only figured Chicago to be a throbbing, skycrappered and windy metropolis – home of the Blues Brothers. Definitely no beaches or sand dunes. I especially like how you say that you have to let learning emerge almost naturally. I also like teaching and facilitating adult learning in a very ‘light-touch’ kind of way, especially as you get to learn plenty too. The #blimage challenge is quite an unexpected bonus, isn’t it!! Many thanks to you for the spark. Fun also, as you note, to see who takes up this challenge and what they do with it. Looking forward to seeing more. Quite a bonus, yes. Thanks for this reminder of not over-orchestrating adult learning. Very timely, as my team embarks on a new attempt to encourage more learning about our ESN. And love the photos, though they are making me homesick for the lake! Any lake! I like the idea of the daily walk. isn’t it also a time of letting new ideas come in our mind a colonize new regions, connect related thoughts without the urge to write them don. A bit like how the grass is coming as patches and grow roots beneath the sand to come out stronger the next year. Here they removed the traditional hazel fences between fields to make them larger and more productive. Only to find after just a few years that this caused some small animals to proliferate and give some sickness to cows, just because some other birds stopped nesting in the branches .Adding walls creates silos, removing light barriers and fences cause disturbances. we know it, yet we keep trying to make things more vastly organized.